When our first born was 2 years old, we were eager to add to his ever growing number of toys, books and room decor. As Muslim American parents we wanted our kids to have access to products that were not only fun but also gave our child a stronger sense of their Muslim identity. But as we soon discovered, few products in this category had the charm and appeal that we could appreciate and that our son could also relate to. Little BIG Kids was born to change that. Young kids ask the most simple yet profound questions about the world around them. My kids are no different. So one night during our typical bedtime routine that included storytime, snuggling, and talking about all sorts of fascinating things, the topic of God came up - and along with it - the most profound question of them all: "Where is Allah?" I attempted to provide a rational explanation, but that strategy didn't work. My drawn out explanation seemed to provoke an endless stream of follow-up questions that I wasn't equipped to answer. I needed a better way to help my kids understand this fundamental concept of God. Subsequent searches online for Islamic themed children's books produced disappointing results. That's when I decided to write a children's book myself. I didn't want to write "just another storybook." I wanted to create one of those books that had great characters with vibrant personalities - characters who would share an adventure and tell positive stories. I wanted to create a book that kids would choose when given the choice - a book that was full of joy - one that even adults would enjoy. But most of all, I wanted a book that helped young kids strengthen their Muslim identity. So after two long years of writing the story and developing the characters, I self-published "Ilyas & Duck Search for Allah." Ilyas is a typical young kid with an insatiable appetite for questioning the world around him. Duck is fun-loving and goofy with a simple view of the world. Together the intrepid duo embark on exciting adventures that culminate in profound realizations rooted in the their Muslim identity. 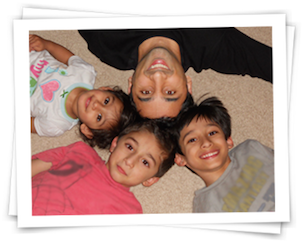 Omar is a Muslim American born in the Middle East with family roots in Pakistan. Omar grew up in New York, started writing children’s books in Washington D.C, and now lives in Doha, Qatar exploring a path less travelled with his wife, three children, a stray kitten named Tic Tac, and lots of noise. Omar is the creator and Author of Ilyas & Duck cartoon characters and children’s book series. Ilyas & Duck Search for Allah is his first children's book. We love what we do and we greatly appreciate your support. Get to know us on Facebook or Instagram. OR simply send us an email.